Gangavaram Port today participated in the Vanam-Manam Programme under the “Mission Haritha Andhra Pradesh” initiative by the Government of Andhra Pradesh and planted more than 5000 saplings in the surrounding areas of the port. 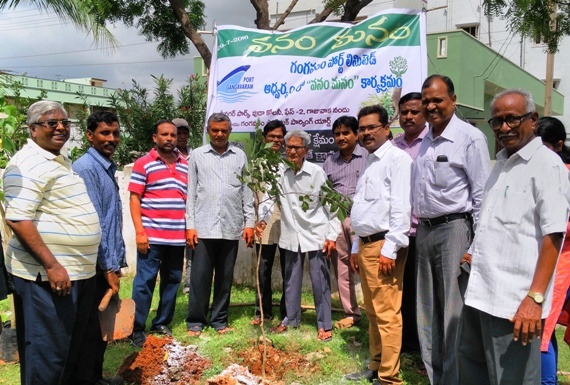 As a part of the program the Gangavaram Port management organised the sapling plantation at the park situated at Vuda Colony, Phase 2 and near Port’s truck parking area in Gajuwaka. The event was inaugurated by Sri Lakshminarayana, Environmental Engineer, APPCB in the presence of Sri V Janardhana Rao, Director (Operations), Sri G Brahmaiah, Director (Planning & Strategy), Sri K Rajaratnam Naidu, Sr Vice President (R&R and Security), Sri M Jaganmohan Reddy, Vice President (Security and Vigilance), Sri LPS Ramu Naidu, Vice President (Liasoning and Security), Smt. D Jyothy, AVP (Environment), Sri M Gopal Rao, AVP (HR&IR) along with school children from 3 different schools who took part in the plantation drive with great enthusiasm. According to Gangavaram Port Management, “Vanam-Manam is a mega initiative by Govt of Andhra Pradesh to increase the green cover in the state. We support the Government in this programme and have today planted more than 5000 saplings in our neighborhood areas to improve the environment and our surrounding.